So I’ve got some bad news. Jurgen Klinsmann did not select me for this years World Cup team. I know it’s hard to believe considering I’m 1) female and 2) retired as of 10 or so years from traveling teams whose international experience included little more than a random exchange student, but still. Those ESPN 30 for 30 episodes were really motivating. And like several of our UNMNT guys this year, I’m part German! 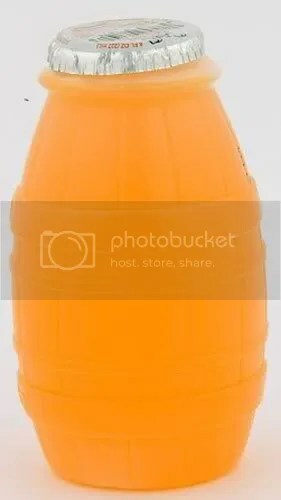 But I’m not bitter. 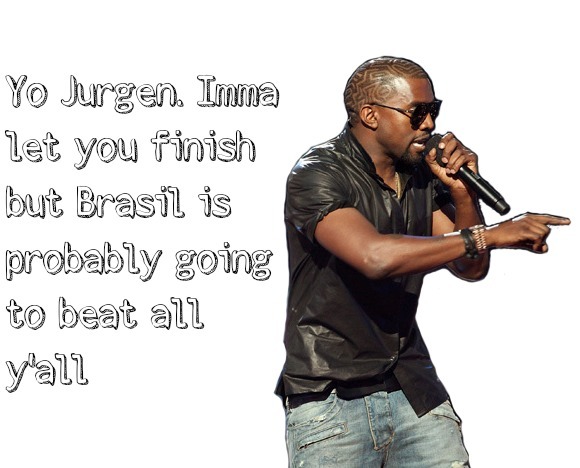 I don’t blame coach K. And unlike Landon Donovan, I’m not going I go all Kanye on you guys. Instead, I’m slide tackling straight into these World Cup games with my vuvuzela in hand and American flag wrap dress on. It’s the only time soccer is treated like a legit sport in America. Everywhere else it’s a religion, yet we’re still over here like hey it’s Saturday morning and my 6-year old is in charge of treats today. Not that there’s anything wrong with youth soccer and post-game treats. In fact, I wish that whole treat thing continued on through college. My personal favorite were fruit roll-ups and those foil-topped mystery juices followed closely by kudos bars andcapri suns. 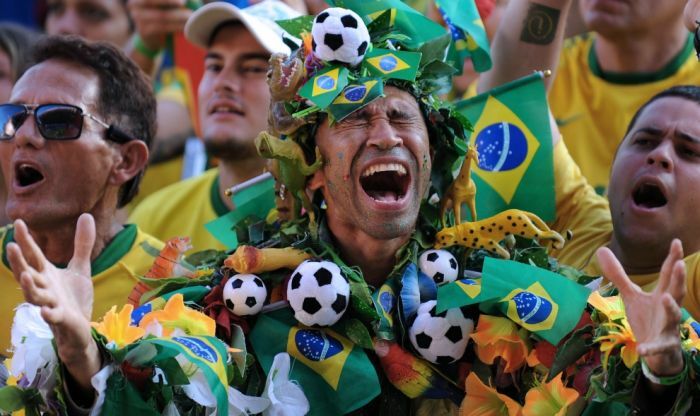 I find it fascinating to see the support that international soccer fans have for their teams. Let’s get serious, they are on a completely different level than us and it’s awesome. Minus those beheadings. Beheadings are not awesome. 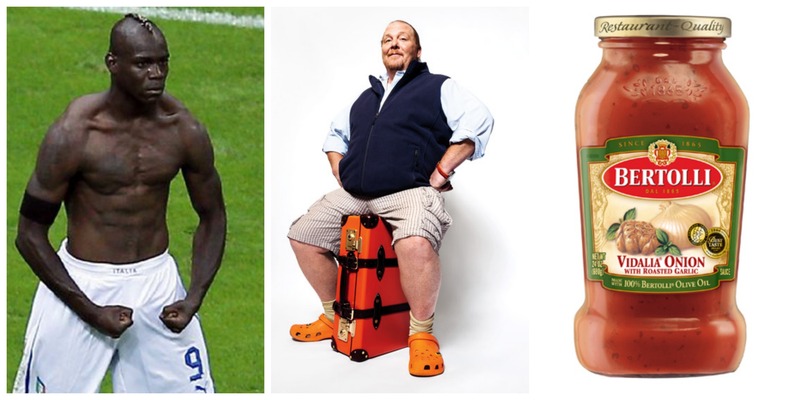 The World Cup gives us a chance to learn the difference between Balotelli, Batali and Bertolli. Key distinctions we need to make in order to not sound like idiots when talking to someone about the games. It’s where, in 1994, my dad went to great lengths to allow his two daughters, ages 10 and 13, to experience the highest level of soccer. I still remember the size of the tickets. The time it took to for us to trek to the top of Soldier Field and nestle ourselves between the packs of Spain and Bolivia fans, increased only slightly by my sister’s crutches as she recovered from a soccer-induced knee injury. I probably wore my Give Blood, Play Soccer shirt and black Umbro shorts. My cousins in similar soccer swag. And while I remember little of the game itself, I can still recall the non-stop chants from the opposing sides as they willed their teams to win. Dad’s dedication didn’t stop there. He was our soccer driver, advisor, non-emergency medical provider, weather reporter and shoe conditioner. He sacrificed his favorite sport so that we could play ours, something that may have gone unnoticed during our teenage years, but is that much more appreciated now that we are adults. So it seems fitting that when discussing an event as significant as a World Cup, that I also celebrate the person responsible for giving me that love. Happy Father’s Day, Dad. Stock up on sunblock because I’ve got a lead on 2022 tickets in Qatar!